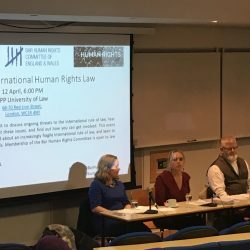 The BPP Human Rights Unit and the Bar Human Rights Committee hosted a special event at BPP Holborn, focusing on opportunities for barristers and students to get involved in BHRC’s international human rights work. BHRC Chair Kirsty Brimelow QC and Executive Committee members Michael Ivers QC and Grainne Melon spoke on BHRC’s recent work included acting as legal observers during the demolition of the “Jungle” camp in Calais, trial observation missions to Turkey and Egypt highlighting systemic failures in due process, mediation work between the government of Colombia and San José de Apartadó Comunidad de Paz, and ground-breaking training on child rights and internally displaced persons for lawyers, judges, magistrates and social workers in Nigeria. They also discussed ongoing threats to the international rule of law, what BHRC is doing to confront these issues, and how lawyers and law students can get involved.